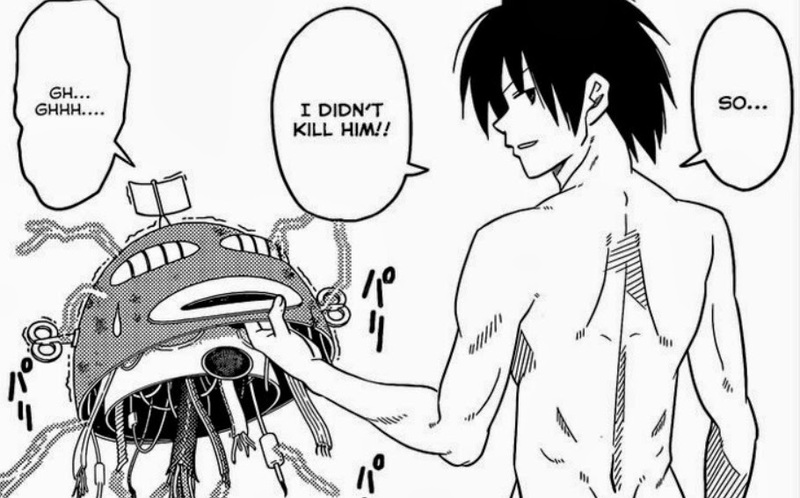 Synopsis: So continuing that ridiculous story thread from the previous chapter, Ikusa saves Hayate from Eight’s robo punch and then declares that he will never forgive him for overfishing for octopuses (octopi? Whatever). Eight goes into flashback mode and explains how Makimura promised to marry him only if he wins 600 million yen via Toto (I suppose it’s some kind of gambling game? Lotto, maybe?) Anyway, it seems that with all his robot calculating powerz, Eight just cannot accurately predict the winning numbers, so he resorts to finding a descendant of an octopus named Paul-kun. So just who is this Paul-kun exactly? 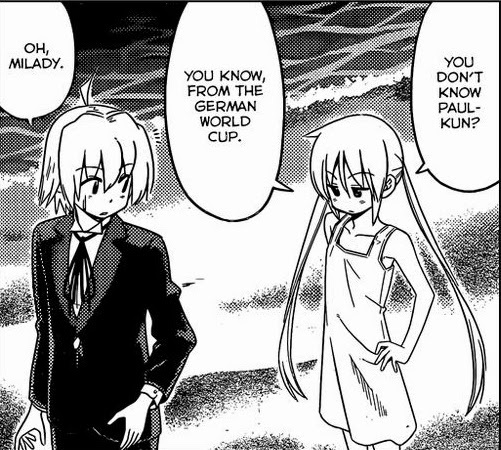 Nagi arrives by Hayate’s side to explain. Apparently, Paul-kun is an octopus who apparently accurately predicted all the results of the football matches played by Germany. Here’s the wiki entry on Paul-kun. So with the flashback over, Ikusa and Eight resume their fight and Eight pulls out dem missiles and literally goes ballistic on Ikusa. 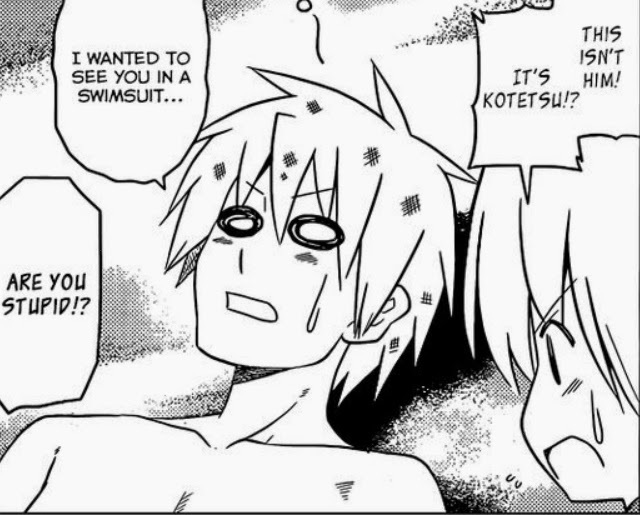 There are explosions everywhere and Hayate fears for his brother and braves the smoke to find Ikusa, but instead, he stumbles upon Kotetsu who had stalked him there because he wanted to see Hayate in a swimsuit (talk about devotion). Ikusa is perched atop a ledge unharmed and goes all hokuto no ken landing a vicious flying kick on Eight whose parts are scrambled all over. Nagi and Hayate comment that it’s all over, but Ikusa says that he’s a lifesaver, thus he protects all life and he reveals that he saved Eight’s decapitated head… just in time for Makimura-sensei to arrive and collect him – and they have a sorta lovey-dovey reunion. Also, Makimura seems to have won 600 million yen via Toto by herself anyway. This is a subtle foreshadowing for the eventual Hayate x Kotetsu ending. Hayate then chases after Ikusa who begins to walk away and asks him if he really is his brother, to which Ikusa replies that he has no brother. 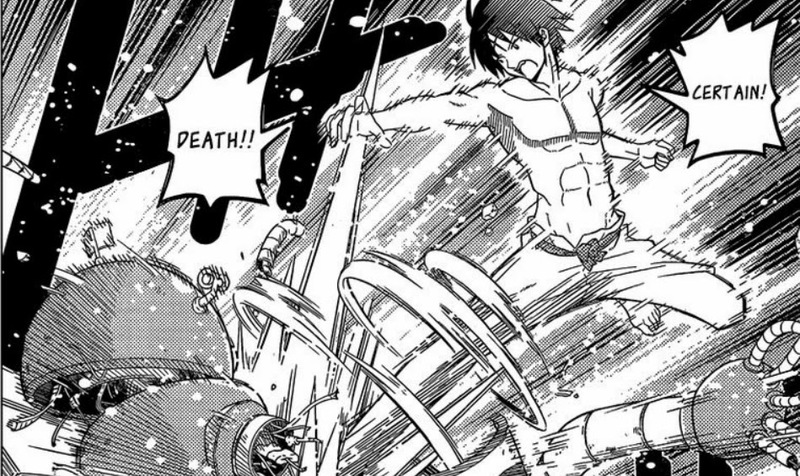 Ikusa: Eight, you are already dead! 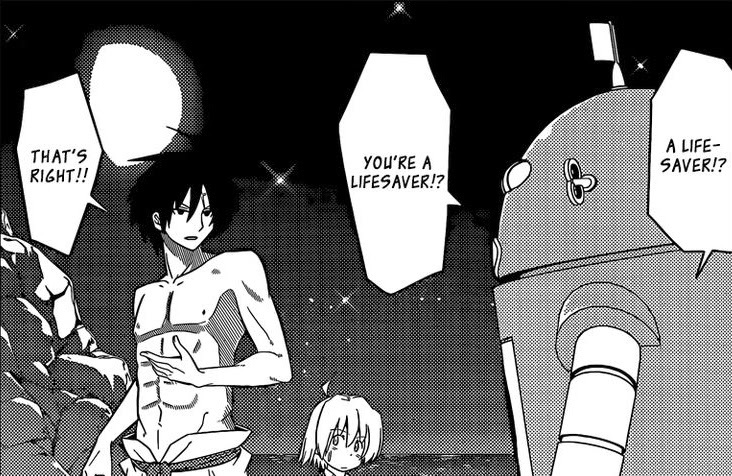 Review: Well, we’re continuing on with these silly beach chapters, but at least the plot is moving steadily forward. Nothing of note yet in this chapter and this mini plot-thread was at least resolved pretty quickly. All I can say is, don’t be fooled by Hata though. This is pretty similar to how the Golden Week Arc was slowly developed until one day, BAM! Things got all serious business. For now, I don't really have much to say about this chapter except that I liked seeing Nagi and Hayate together... as always. Should be: I'm too epic to have a brother! 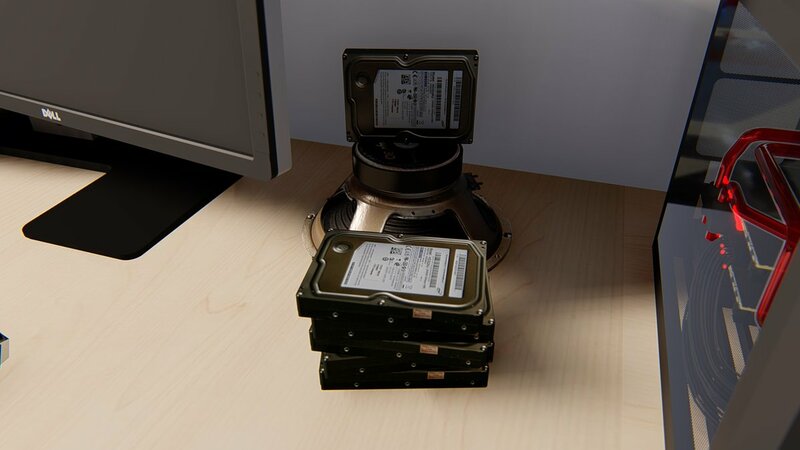 In any case, we’ll just have to wait and see where this story takes us. Anywayz, March 3rd is the birthday of the series’ undisputed, most popular character (especially worldwide), Hinagiku Katsura. 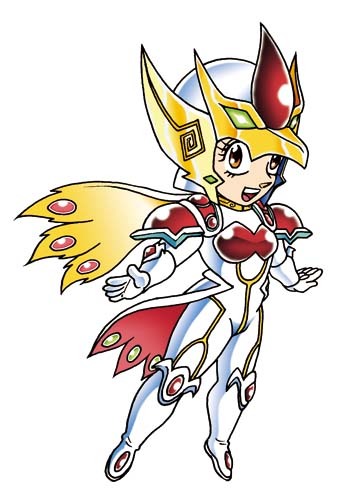 Now I’m not really much of a Hina fan, but I do like all of the characters of this series to some degree. Hina still ranks pretty high on my list above the minor side characters, in any case… so here’s some birthday fanart from me, Hina-san. 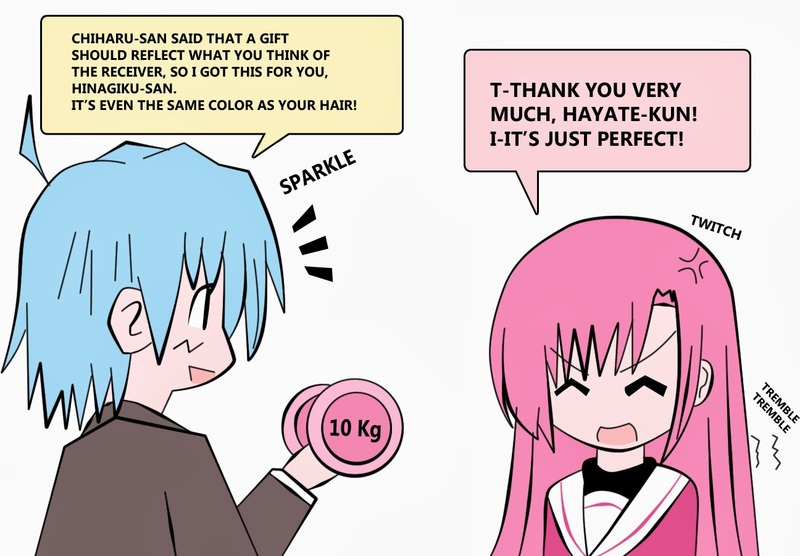 I could totally picture Hayate actually doing this too.